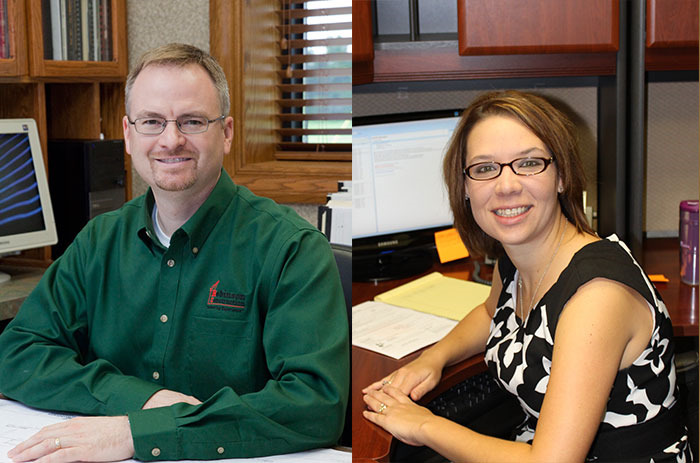 Robinson Construction Company is pleased to announce the recent addition of two new employees at their main office in Perryville, Missouri. Brian Bruns, PE, has joined Robinson Construction as a Project Engineer. Brian attended Southeast Missouri State University and the University of Missouri-Rolla where he earned a B.S. in Civil Engineering with an emphasis in Structural Engineering. Prior to joining Robinson Construction, Brian worked as a Senior Engineer for a construction firm in Illinois. He has nearly 15 years experience working in the construction industry and is a licensed professional engineer in several states, which adds considerable capability to the Robinson Engineering Department. Jennifer Fritsche has joined Robinson Construction as a Payroll/Accounting Assistant. In this role, she will be responsible for assisting the payroll and accounting departments with day-to-day transactions. Jennifer attended Jefferson College and Southeast Missouri State University where she earned a B.S. in Business Administration with an emphasis in Human Resources. Prior to joining Robinson Construction, Jennifer worked as a Payroll/Human Resources Administrator for Cape Girardeau Honda.